Alec Howard with his Mug Library, now available at the Arcata Farmers Market. SCRAP Humboldt designed the sign. Our culture thrives on stuff. Stuff to buy, stuff to eat, stuff to put in our windowsills to express our preference for one kind of stuff over a different kind of stuff. Most of that stuff comes wrapped in other stuff, and most of it — around 251 million tons of it, according to the Environmental Protection Agency — gets thrown away every year. It takes a unique person to say "Enough!" to stuff and, of course, that person can be found here in Humboldt County. Student, employee, lover of local beer, irregular face-shaver and roommate-nagger: From one perspective, Alec Howard is pretty average. But his day-to-day choices reveal another narrative: a warrior doing battle with a consumerist system constantly attempting to undermine his deepest-held beliefs. Howard doesn't take any crap — no throw-away plastics, receipts or candy wrappers — and he tries not to leave any crap. 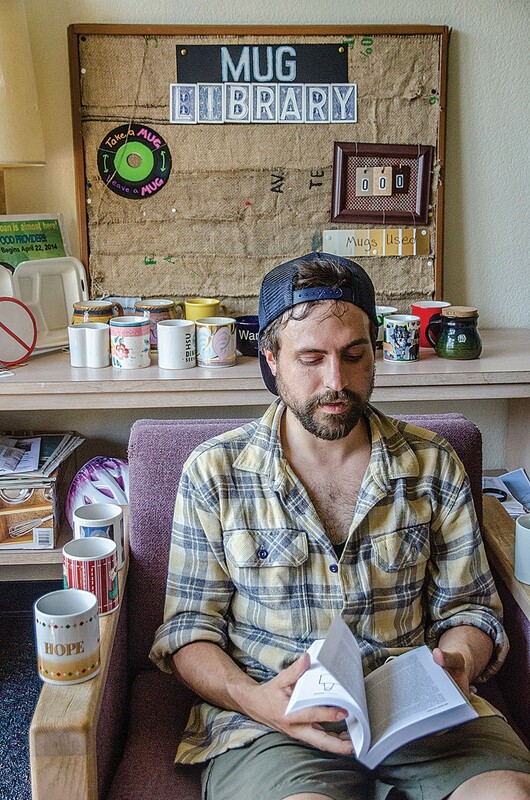 Inspired by a stint in Sunnyvale working at a materials recovery and transfer station, he decided to go Zero Waste when he moved to Humboldt in January of 2015. One of the latest philosophies to come out of the green movement, Zero Waste is constantly being redefined and lives under threat of dilution by greenwashing wannabes. Advocates are currently fighting for a certification standard for companies of "90 percent overall diversion from landfill and incineration for non-hazardous wastes." 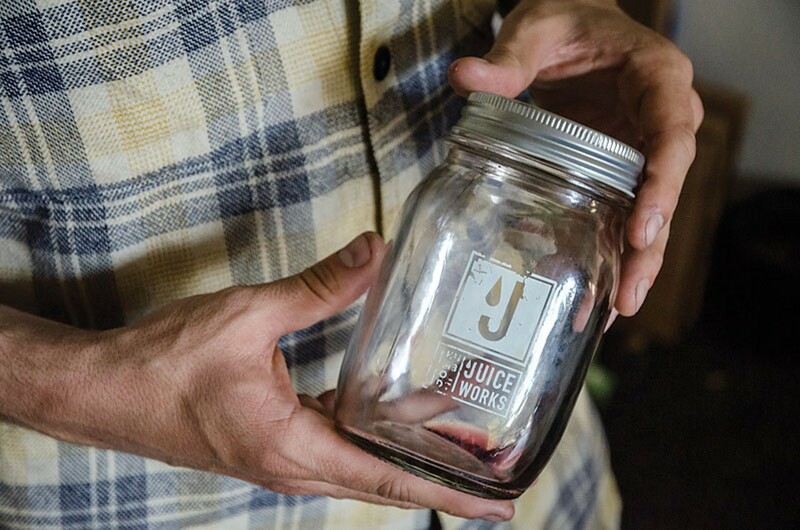 Zero Waste has found an online niche with the Mason jar fetishist and DIY crowd. Lifestyle curators such as Bea Johnson, author of Zero Waste Home, have capitalized on its clean, simple ethos with Pinterest-ready images of reusable water bottles and unbleached cotton dishtowels. "My family of four generates a quart-size jar of waste per year, and so can you!" Johnson says on her blog. But can you, really? And how far are you willing to go? Many people who practice the Zero Waste lifestyle agree that creating a life where nothing is thrown away is nigh-impossible, even without the additional hurdles of avoiding recyclables (too much carbon footprint in the recycling process, too many recyclable items aren't recycled), buying local (less of a carbon footprint from shipping), and not using public utilities or transportation that rely on fossil fuels. For one month, Howard did it. He diverted rainwater off the roof of his dormitory to wash his clothes. He used moss instead of toilet paper and reused his dental floss. He transitioned from vegetarian to vegan. He had already sold his car and bought a bike, but now he charged his phone and laptop with a small, portable solar panel converter. "I was pushing myself," he says. "I wanted to know, how much change can I really effect? I found my limit." Toward the end of the month, Howard's new routine became habit. But he acknowledges his passion had some diminishing returns in terms of his ability to carry his message. University staff was not thrilled with the rainwater diversion. His "disheveled" look was a distraction. Today he has returned to some creature comforts and relinquished the obsession of zero impact, Zero Waste. Every decision has ancillary consequences, from shopping in a natural foods store that uses fossil fuels to keep its lights on, to being interviewed by a reporter who drove to the appointment in a less-than-fuel-efficient car. Howard finds the web impossible to detach from, but today he's narrowed his focus to combatting climate change and converting others to the beauty of a life that doesn't include single-use, throwaway items. "I'm less focused on myself than I once was," he says. "It's hard to be perfect. I want to have a broader impact. You don't have to think of it as a movement, just part of your life." This is a day in the life of a Zero Waster. 7 a.m. – Coffee. Howard makes coffee at home with a reusable coffee filter and carries a Mason jar with a handmade cozy for his to-go needs. Single-use coffee cups are his pet peeve. He recently got approval to set up a mug library at Arcata's Saturday Farmers Market, where people can pick up reusable cups, fill them at nearby cafes and then return them after they're through strolling. They will be washed at a nearby community kitchen. "This is, hopefully, the beginning of something epic," he says. Howard also spearheaded a movement to get rid of paper cups on campus. As of April 22, Earth Day, students who want paper cups at HSU dining locations will have to buy them for $1 apiece. Several nearby coffeehouses are expected to follow suit. "If there's one low-hanging fruit," he says, "it's the dang coffee cups." 8 a.m. – Off to class (Howard is an energy and climate major), but first a stop to check on the micro-garden Howard installed downstairs, a little beyond the shade of the towering redwood trees that loom above the dormitories. Food sovereignty and hyper-local sourcing are important tenets of Zero Waste, as is reducing food waste. The garden, which is about the size of the hood of a car, now boasts lettuce, kale, mint and lavender. When he first approached the university about planting a garden in what he saw as wasted space, officials asked him for a plan and proposal. He stayed up all night and wrote a 10-page plan. The housing department granted his request, kicking down the money for soil and wood. He uses gray water from his dishes to water it. 9 a.m. – Bike to work, then pick up the keys for the work truck. "I made a commitment to abstain from fossil fuels, but to do my job I have to drive a big truck around town," he says. As a resource aide with the city of Arcata, he spends a lot of time getting dirty with compost, garbage and recycling. His two biggest nemeses are Styrofoam and free piles, which occasionally overlap to horrific effect. Free piles, where people leave boxes of stuff on the curb to be picked through, are "well intentioned," he says, but don't usually accomplish what was intended. Their contents too often end up in landfills. When he worked at the materials plant in Sunnyvale, Howard was in charge of implementing and enforcing a Styrofoam ban for the city "almost singlehandedly," knocking on doors and giving presentations. Today he gets an alarmed call from a citizen about two abandoned curbside boxes of Styrofoam pellets that are being blown all over the block. He drives to the address but finds nothing, drives a few blocks over and finds nothing. Finally, upset at the waste of fossil fuels, he returns to the office. 12 p.m. – Class. Howard does some of his studies online, but eventually he wants to get rid of his cell phone and laptop and live a simpler life, possibly on a piece of land. 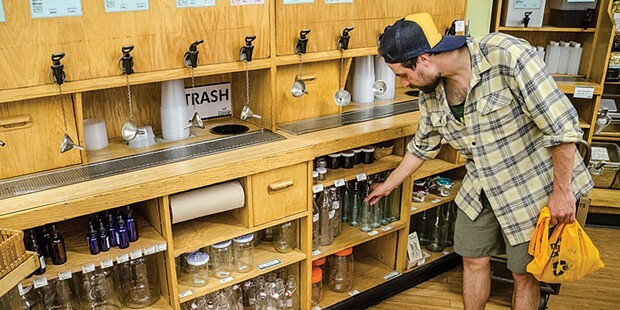 Although his community and many of his professors are responsive to his choice to go waste-free, his lifestyle still requires more disposable matter than he'd like. He gently refuses as much detritus as possible. "As a college student, it's hard," he says. "The paper they bombard you with. Everybody has a business card they hand you." He has saved every piece of paper he's received in the last year as physical proof of their ubiquity. "Don't even get me started on pens and pencils," he says. 1 p.m. – Lunch. Howard finds haven in Arcata, which is small and easily navigable by bike. 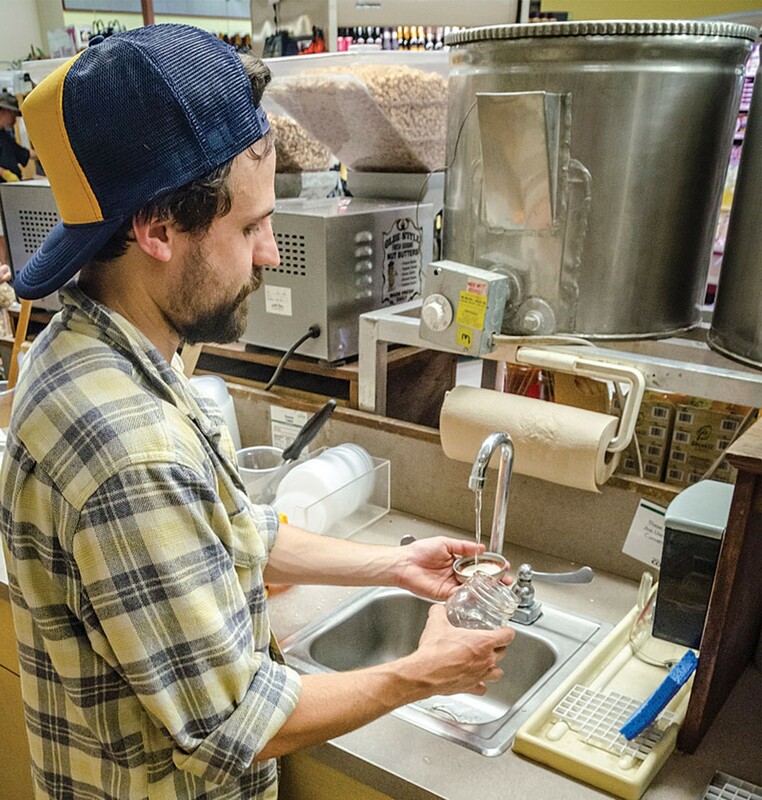 Many of the local eateries and grocery stores cater to his lifestyle, offering reusable options for smoothies, popcorn and beer. Lunch often finds him at the Co-op, filling the same Mason jar he used for coffee with soup. He carries a separate jar for his compost. When offered a free sample of beet juice in a paper cup he demurs, saying, "I'd love to, but I'm on a Zero Waste mission." The tabler pours some of the juice into his Mason jar instead. He drinks it, thanks her, then goes to wash his jar out in a sink next to the bulk food section. 2 p.m. – Back at work. Another call comes in about the Styrofoam packing pellets. This time, it's a different address, and Howard realizes to his horror that he'd gotten a garbled message in the morning. He rushes to the corner and finds it covered in the hated stuff, for almost two blocks in every direction, like a strange snow storm. Styrofoam pellets are rolling into the storm drains. He calls for back up but everyone is busy. He's forced to pick up the pellets one by one and put them into equally-hated plastic garbage bags. It takes three hours, with the pellets blowing in the wind. Because of their fragility, he must handle each one with an ironic tenderness, to keep them from disintegrating in his hands. 5 p.m. – Happy hour. Howard enjoys a trip to the local breweries, including Redwood Curtain, which allows him to fill a reusable growler. This is also when he does his grocery shopping, visiting the bulk food section of local natural food stores with a collection of Mason jars to fill with essentials like lentils and nuts. 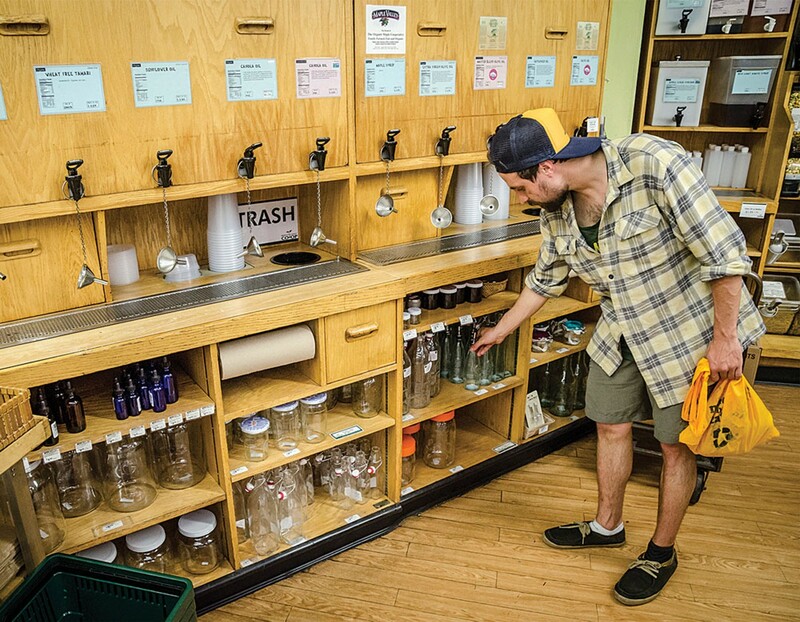 These stores are usually accommodating to Zero Waste shoppers, asking that they stop in at customer service and get the tare weight for empty containers, which can be written down and handed to the cashier at checkout. But Howard doesn't want the extra slips of paper. Instead he memorizes the weight of the jars, and the codes for the bulk items. 6 p.m. – Mail call. College students receive a lot of junk mail, another pet peeve of Howard's. One chronic offender was Suddenlink, a local Internet provider. After contacting the company several times and asking it to stop sending him mailers (which arrived around twice a week) he instead began collecting all of the mailers that arrived for him and other students in the dorms, then brought a backpack full of them of them into a university career fair where the company was tabling, dumping them out in front of the representatives and yelling, "I don't want it, you take it back!" University police were called in to mediate, but Howard was not charged with anything. "It caused a big scene," he admits. Still, the mailers continued to flow in. After months of diligent research, he managed to find the email addresses of the company's top executives. He sent them a blistering mass email. After some back and forth, he says the company's marketing director has agreed to stop sending mailers to the 2,000 campus residents. 7 p.m. – Downtime. "I've been trying to be somewhat normal in the dorms," says Howard, who shares a suite with four other roommates. He has pared down his possessions a great deal, but still struggles with discarding things that might be useful. "Necessities are food, toiletries and shelter. Everything else, you have to isolate specific areas of your life and think about what you need and why you need them." Abandoning stuff leaves more time for pursuits like reading, he claims. One prized possession is an autographed copy of The Story of Stuff by Annie Leonard, an analysis of overconsumption. 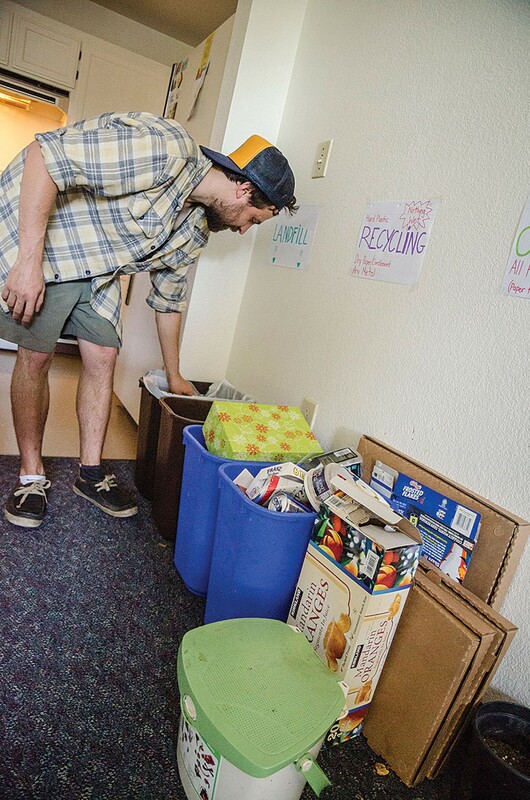 He has been coaching his roommates on how to reduce the amount of stuff that goes to landfill, and he occasionally picks through the household garbage to sort it into recycling and compost bins. "I think a lot of people are still skeptical about it, they think, 'It's just something Alec does, it's a hobby.' But that's not it. It takes attention, time and care." 9 p.m. – Nighttime routine. Toiletries are a major obstacle for many people trying to go Zero Waste because of packaging. Making your own toothpaste and deodorant using baking soda, essential oils and other ingredients is always an option. Howard swerved on this one by eschewing some common personal care products. He stopped shaving and uses bulk, unwrapped soap for most of his hygiene needs. Since he has gone vegan, he claims his body odor has decreased. He is still working his way through a tube of toothpaste and isn't sure what he'll do when it runs out. 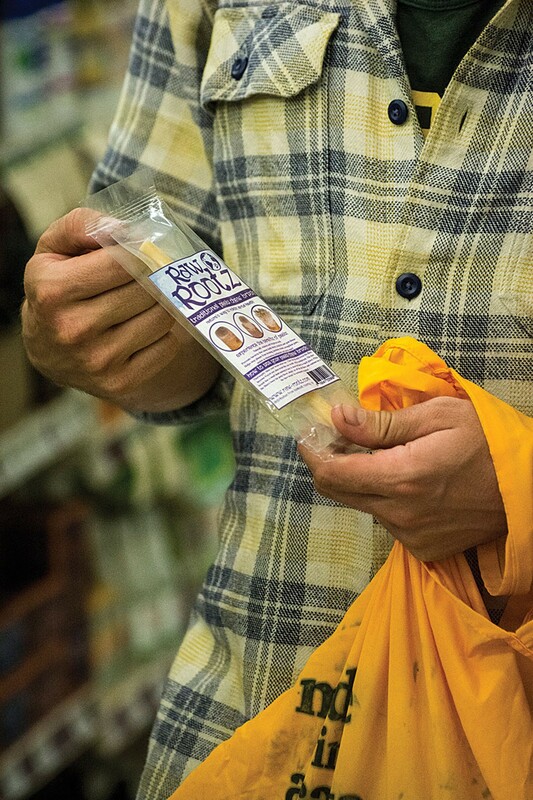 He does use a compostable bamboo toothbrush, although he bemoans that it and several other options (including a chewable root) come packaged in disposable paper and plastic. "It almost defeats the purpose," he says. 10 p.m. – Off to bed. While Howard says he has found a welcoming community in Humboldt County, his lifestyle is often lonely. "I feel silenced a lot of the time," he says. "Zero Waste is a small part of a big environmental picture. The scope of the problem is enormous. At first I was a small fish in a big pond. Even among other environmentalists I was considered crazy. I'm so committed I don't really have time for a personal or social life." Next semester Howard will be moving off campus and it remains to be seen whether this change will help or hinder his attempts to live a waste-free life. From his perspective, society is entrenched in the complex mechanisms of convenient consumerism, in which somehow it makes more sense for people to use and discard a plastic spoon that will outlive their great-great-great grandchildren than to just carry a metal one of their own. "When the climate starts changing, how can I say I didn't do everything? I'm what people would refer to as a purist, but I consider myself a realist," he says. "Are we really that smart or advanced? We put food in the garbage while people go hungry. I want to believe that we're smarter and better but I just struggle to keep my sanity." Last semester he tried talking to a counselor at HSU about his frustrations. Instead of helping, he says, it made him angrier. His counselor was holding a paper coffee cup.